The most important person a wine producer can invest in is he or she who first comes into contact with a visitor to the winery tasting room or at a show. Enthusiasm, knowledge and a helpful attitude will leave the visitor with a positive impression, encouraging visitors to return and tell their friends. I was reminded of this importance at the Vineyard Hotel’s recent Pinot Noir Festival, a public event to which I was kindly invited by the hotel. Producers were scattered around the beautiful gardens, each with their own table and, thankfully, given the heatwave over that weekend, with large bowls of ice to keep the wine chilled. (There’s little worse in the red wine spectrum than warm pinot.) Many of those pouring the wines were owners, family members or long-time members of staff, who know the wines well. Their tables were generally well-attended. Regrettably, there were one or two who had less aptitude for the job. One lady immediately got my back up by calling me dear, which is by the by but perhaps not the best way to address visitors. She also seemed to know little about the wine. In so many ways, she didn’t convey the sort of image this well-reputed winery deserved. There was a problem with the pinot of another producer, who wasn’t represented by either winemaker or marketing manager. Knowledgable friends agreed that the wine wasn’t as it should be. I hate to think how many visitors who don’t have our experience, just didn’t like the wine and will avoid it, and maybe the producer, in future. I have since alerted the winemaker to the problem and hope it’s confined to a limited amount of the production. This experience led me to reflect on two very different media functions held just prior to the pinot festival. The one, hosted by Zonnebloem, a long-established South African brand and part of the giant Distell stable. 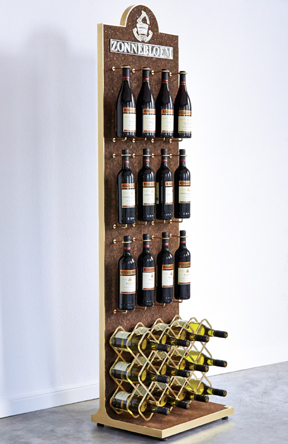 The purpose, to bring guests up to date with the wines themselves, which now carry the tagline ‘crafting contemporary classics’, and introduce a range of merchandising units specifically designed by master designer, Haldane Martin for restaurants, bars and retail outlets. Each reflects some aspect of the winemaking process and is also a contemporary classic. A different and attractive marketing approach, as I hope the photos show. The presentation, by the winemakers, cellarmaster, the affable Deon Boshoff with white winemaker, Elise Coetzee & bubbly assistant winemaker, Praisy Dlamini, was relaxed and thankfully not full of boring corporatese. (Red winemaker, Bonny van Niekerk, was ill, so unable to attend.) With great generosity we were first treated to three old Zonnebloem pinotages: 1975, 1982 and 1995, the last boasting a contemporary 12.10% alcohol, the 1975 still a very golden oldie and my favourite. More recent vintages were poured at the lunch which followed. All offer great value, but my pick is Laureat 2010 (around R80-90), a Bordeaux-style blend, nicely dry, soundly built and good drinking. 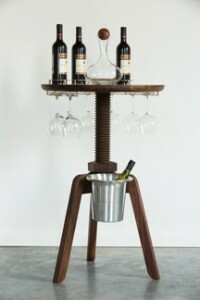 A contemporary classic for contemporary winelovers. A pub is not your normal setting for a wine launch; well, it wasn’t exactly a wine launch and there were just four of us media folk present, myself included. But then there’s nothing too normal about Pieter de Waal, he of the quirkily different but delightful Hermit on the Hill wines, and Krige Visser, partner in and marketing manager of Mount Abora wines. They had invited us to taste some of their most recent releases and advise they had formed a conglomerate; ‘Not an amalgamation, as we are keeping our separate identities whilst working together,’ de Waal explained. Also part of the team is Mount Abora’s talented winemaker, Johan ‘Stompie’ Meyer. Consider names such as The Infidel and Knights in Tights on the one – Hermit – side and Mount Abora Koggelbos and The Abyssinian on the other (Coleridge Taylor lovers will recognise these latter as taken from his famous poem about Kubla Khan). If these aren’t ordinary wines, they still tantalise the palate of all who enjoy the myriad different flavours and textures the fermented grape can offer. For de Waal, think natural ferment on skins and stems, both for his Infidel 2012 and Knights in Tights 2013; the former a old-barrel aged sauvignon blanc, singing sauvignon’s tune with oxidative notes and a carpet pile texture as points of difference and very drinkable. Knights from mourvèdre, is what de Waal calls a ‘luminoir, a light red gaining its colour from four days on skins and stems then aged in old wood. It’s bone dry with loads of flavour but only 10.89% alc. Mount Abora Koggelbos already has a keen following; Abyssinian deserves similar attention. A mourvèdre, cinsaut, shiraz blend, the 2012 has purity of fruit with richness of texture but also notable, fine grape tannins. 12% alcohol and a price tag of just R140 (the rest of the wines we tasted retail for between R80 and R95, seriously amazing value) should entice all who know – & those who don’t yet know – the Mount Abora range. These two events were successful simply because they’d been designed to make presenters comfortable and guests interested. Others could learn such lessons.